Aunt Clara’s Dominican Cooking, besides being a collection of recipes of the Dominican Republic, a source of information about our cuisine, dishes, ingredients, and history is also thought as a help for those who want to learn about the Dominican culinary culture. Dominican cuisine is easy and spontaneous. As in any other part of the world, recipes are passed down from generation to generation in the kitchen of our Grandmas, Aunties, and Moms. Because the recipes are not always written down, we learn how to cook our vernacular dishes, yet we could hardly tell how much of “this” or what proportion of “that” is needed. Other countries and influences have found their way into our kitchens too: From Chinese to Middle Eastern, and more. Pasta is a fundamental part of Dominican cooking; spaghetti was once called “the meat of the poor”. Exotic ingredients, like salted codfish and salted smoked herrings, are commonly found in our kitchens. After all, if we say “let simmer for 5 minutes” and at minute 4 it looks like it will start to burn, you should know what to do, right? The base of Dominican cuisine is the sazón, which is a mixture of spices and herbs, sautéed until the flavors are set free. Typically a sofrito incorporates thyme, salt, mashed garlic, parsley, onion (finely diced), green pepper, coriander/cilantro, tomatoes, tomato paste, and vinegar. Many Dominican dishes are prepared using this mixture. Sometimes, to shorten the preparation time, people blend these ingredients and keep them in the fridge for a “ready-to-use” seasoning. In some Dominican households it is very common to cook using too much oil, however, this is not how most Dominicans cook. Our recipes here contain the minimum of fat necessary for each specific dish. We have tried to maximize the great nutritional advantages of Dominican cuisine and in most recipes, we did not include a fixed amount of salt. That is because we want you to adjust salt to your own liking. As with most ingredients, you should feel free to adjust them to your taste. 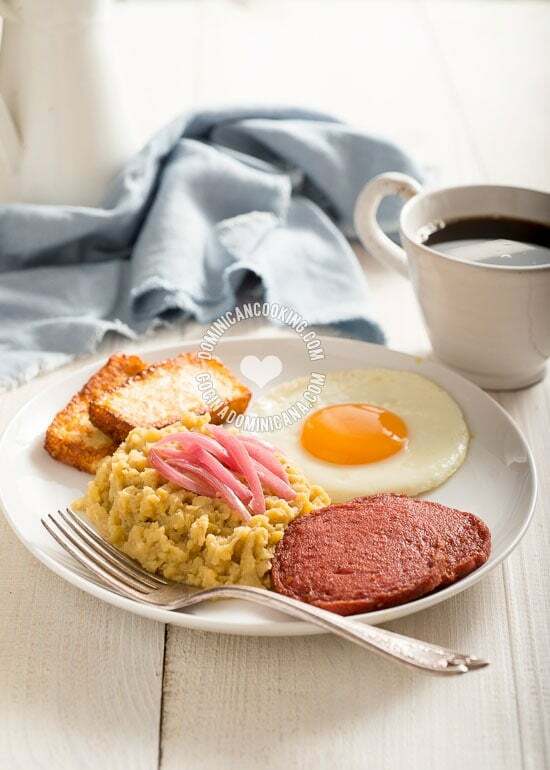 Breakfast for Dominicans is usually a light meal; the same dishes prepared for dinner are also prepared for breakfast, especially when one needs a hearty start to the day. A typical Dominican breakfast could consist of mangú accompanied by scrambled eggs and topped with sauteed onions. A few pieces of boiled cassava or another root is a good substitute for the mangú. This can also be accompanied by a few slices of fried Dominican cheese (its consistency and taste similar to that of Haloumi cheese, but is made of cow’s milk) and maybe some scrambled eggs a la dominicana. You can also accompany it with a couple of slices of deep-fried salami. A cup of cocoa, or latte is a suitable ending to this breakfast. La comida (lunch) is the most important meal in the Dominican Republic. The family will gather around the table to share La Bandera Dominicana (the Dominican flag), our traditional lunch meal. This consists of a combination of white rice, red beans, meat (chicken or beef) and salad or a side dish, and when prepared correctly, it becomes a meal that includes all food groups. The fresh ingredients provide for a meal that is not only delicious but also healthy and nutritious. Accompany your lunch with a glass of ice water and end it with dessert, followed by a cup of coffee (un cafecito). Most of our recipes are traditional Dominican Recipes, from the Dominican repertoire, compiled and written by us. 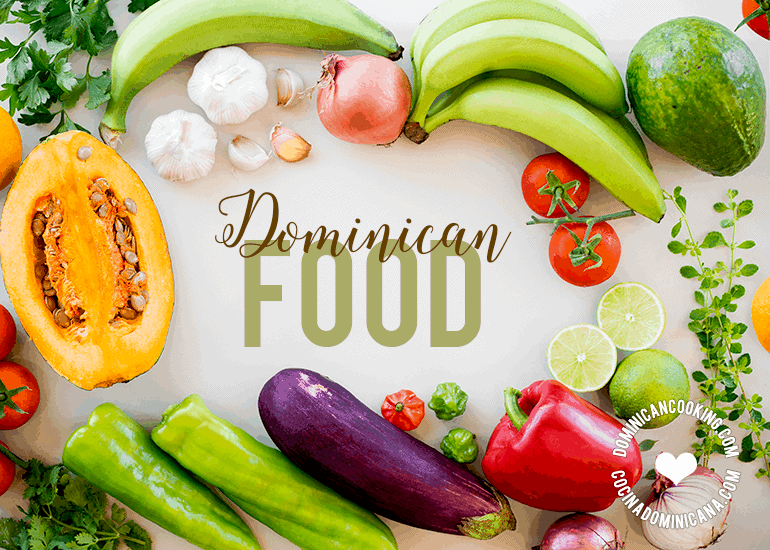 The Dominican diet is rich in fresh ingredients and simple food. Some of these dishes, however, are very sophisticated and require planning and preparation. We have tried to make the recipes as easy to understand as possible and suggest substitutions whenever we know an ingredient might be particularly difficult to acquire outside the Dominican Republic. You will find here authentic Dominican dishes and meals, just like Mami makes them, however, and as we constantly remind our visitors, they may differ from the ones that you have tried in your own home. Remember that each family has their own cooking style and secrets. Alongside the traditional Dominican fare we have also included recipes of our creation, that may be inspired by the flavors and ingredients of our cuisine. You can see our traditional Dominican recipes here, which you can recognize because we have added the original name in Spanish, followed by the translation into English, or read about our top 10 must-try Dominican foods. Love your posts. A number of my family members are vegetarians. Although I make a very good vegetable pastelito, it just does not taste like one – more like a veggie empanada. Do you have a receipt that could come close to the traditional pastelito? We sure do: empanaditas dulces, pastelitos salados. Thanks, Nancy, for visiting us, and for the nice words. Please can you help my daughter (6 Years old) has to do a project on the Dominican Republic and would like any information you may have on the food and the countries cultures. This is a good first intro to Dominican cooking, for more you can see these: http://auntclaratest.wpengine.com/kitchen/cooking-basics. I can tell that this piece was upgraded, especially about the different groups that have contribute to the shaping of the cuisine. It also seems you’re trying to fill the needs of vegans too, since other sites are popping up with vegan Dominican food. Don Hawley happened to run across your post. Your name sounds familiar. Are you traveling in a large group? Aunt Clara- I appreciate you posting information about the Dominican Food. I will be in DR for the first time at the beginning of February. Are there seasonal foods in February? I can’t wait to try the local cuisine. Honestly, you’ve put my mind at ease on what to expect. Do the foods tend to be on the spicier side? Thank you in advance! We have a few spicy dishes (not too spicy, really), but for the most part we prefer spiced to spicy. Pardon my ignorance, but who is Don Hawley?